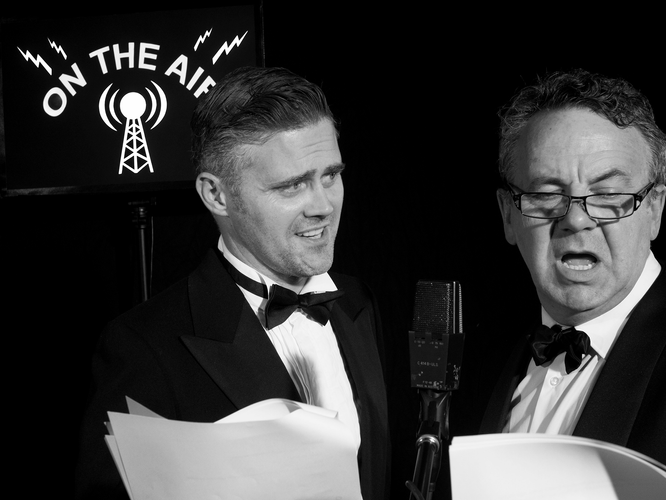 Comedy legend Michael Veitch and handsome young blade Simon Oats dust off their double-breasted dinner jackets to revive the golden era of 1940s radio drama. Tune in as the radio veteran and brash newcomer transport us back to a time when radio was king and political correctness was unheard of. It's mayhem in the studio as the weekly radio drama serial featuring 'Man of a Thousand Voices' Clinton Webb (Veitch) is about to go to air. Ever the consummate professional, Clinton has been forced to share the microphone—and the limelight—with the new darling of the airwaves, Tony 'The Ace' Hamilton (Oats), in a bid to rescue ratings. Sure, he may be talented and considerably younger (not to mention a sure fire hit with the ladies), but Clinton has just about had enough of the dashing young matinee idol's complete lack of professionalism. Waltzing in and out as he pleases without preparation, Tony causes more drama through his 'off-air' shenanigans than the radio plays they're meant to be performing! The show must go on, as they say—but can it?